A tour starting in Valencia is a great way to see Spain. The trips vary from Tomatina to Adventure to Discovery tours and span across 3 day to 8 day itinerary with prices ranging between $22 to $149 per day. "I've done this tour two year in a row with Pepe and Ash and plan on doing it again...."
"La tomatina with Stoke Travel was amazing. 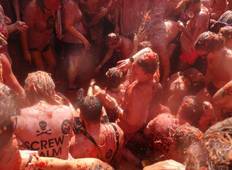 It is very thing you expected from the..."
"Me and me three friends stayed with stoke last year for La Tomatina. It was fun from..."
"Overall it was a great festival, really enjoyed it! The staff were amazing and very..."